I have been trying to read this book for some time. I started it a couple times but never really got through it because of my busy schedule. I finally just ended up listening to the audio book. I love the stories he uses to teach. I learned a lot for this book. My only reservations with recommending the audio book is that I find his voice somewhat annoying at first (sorry). It took me a while to get used to it. Now that I am more used to his voice I could probably listen to another audio book, but if you have the time I would recommend just reading it. He also has great quotes through out it, so it would be a great reference to have the physical copy (or even ebook version.) I did enjoy this book and learn a lot from it. I would recommend it for young adults and adults. I loved this book. I have read all of Brad Wilcox's books and I have enjoyed this book as much as any of his other books. I knew that I would learn from this book, and I did. I didn't just read the book, I took the time to understand the principles that Brad was talking about. As I read I realized how many times I have experienced the Grace of Heavenly Father and His Son in my life. It was explained in such a way that Grace makes sense to me and in ways I would never have thought of. I was so excited to share these concepts with my friends as I read. Brad made Grace so easy to understand. A person can't go wrong by reading and studying this book. I will be reading it again. Brad Wilcox lives these principles and he understands them. I have known Brad for many years and so I am comfortable saying these things. Even though he is L.D.S. anybody wanting to understand Grace better would be comfortable reading this book. One of the greatest things I love about Brad Wilcox is that he teaches through stories. I love the stories he shares! This book will help you understand the enabling power of the Atonement-- GRACE. Powerful! Thought-provoking! FANTASTIC BOOK! This book is amazing! It is easy to read and enjoyable. The stories are wonderful. It has definitely expanded my understanding of God's grace. It has made the doctrine of Grace much clearer to me. I just finished reading it and I will certainly read it again, probably more than once more. Absolutely worth reading and sharing. Love it. I've read The Continuous Atonement and just finished Changed through His Grace. While those books are similar, they are nothing alike. Brad Wilcox has such a gentle but firm and straight-forward way with what he says. He covers so many different aspects of grace in this book. If one chapter doesn't seem like something you need to hear, most definitely the next will. I listened to the audiobook version and honestly I'm a big fan of hearing the author speak his own words. It's like listening to a fireside or talk instead of reading a book. I love that you can hear how much he truly believes what he's saying as well, which, in my opinion, adds another dimension to his words. If you're struggling with pretty much anything in your life, be it just having a rough day, dealing with addiction, losing someone close, just needing a little push/motivation to keep going or whatever it may be, this is a great book and is so very much worth the read (or listen). I do believe Brad Wilcox's approach to grace is a critical key that the world needs today... especially in the Church. I grew up in a largely Jewish area of Los Angeles. We had three synagogues within ten miles of my house, two reformed and one conservative. As my heart turned to religion (I joined the Church at age 14) I had difficulty understanding how, especially for reformed Jews, their relationship with God had turned largely cultural. Many of them, regularly attending synagogue, considered themselves agnostic. Religion was cultural... their identity... but not soul changing. God had no power. Now, I'm seeing very similar traits in the LDS faith, especially in young adults. So many priesthood holders don't have in their hearts that God has power in their lives. They don't believe that people can change. They don't believe in the power of the Priesthood. They come to church to belong and be social and to serve but not to CHANGE. As a church, we need to be more than comfortable. We need to be changed. We need to accept the atonement. We need to believe that anyone can change from any situation to become a new man through the Grace of Christ. Then, we will grow closer to Father and know our potential. Thanks for shining the light on this. I pray that many hear the message. 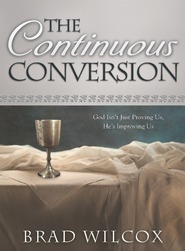 Another great book by Brad Wilcox! If you have liked his previous works, you will enjoy this book as well. There are many valuable nuggets -- one of my favorites was his discussion of a line from "There is Sunshine in My Soul Today," which says in part, "The flowers of grace appear." I had never thought about this line, and learning more about the author of the hymn and the backstory behind it was enlightening. Highly recommended! Loved this book, easy to read and understand! I loved this book! I loved that it's easy to read. you'll understand what the author is teaching, whether you're the smartest person on the block or just a normal teenager going to high school. This book really is written for a wide audience of readers. This book is full of personal stories about the author, his family, and people that he's talked to or received letters from. This makes the topic seem to relate to every person who could or would ever read the book. Grace is a concept that, to me at least, has always seemed pretty abstract. I loved the way the author makes it easier to understand this divine principle and just how it works in our lives. I loved the way it made me think about grace more than I ever have before. Just this morning as I was reading my scriptures, I noticed a verse about grace and learned just a little bit more about it. I think that for me, I've kind of always just ignored grace and focused more on my works. But from now on, I'm planning to look for grace - both in the scriptures and in my own life. And I think that as I look I'll find it and learn more about it a little at a time. I loved the way the author used not only conference talks and scriptures to teach, but he also uses a lot of hymns. I don't know about anyone else, but I do know that the hymns touch me in a way that nothing else can. I loved that he took the time to include hymns to teach us. Brad Wilcox is really a master teacher. It's no wonder that he is a popular teacher at EFY and Time Out for Women. Make sure you take the time to read this one, it's amazing!